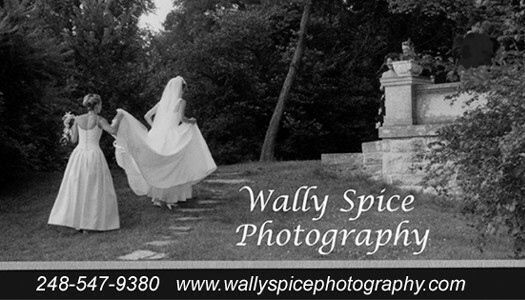 Wally started Wally Spice Photography 21 years ago from her home in Hazel Park; her daughter Julie joined her about 15 years ago, photographing primarily weddings ! At that time this area was pretty traditional on the whole. We went to national and statewide conventions and the local photography organizations, etc. and helped bring the more relaxed "Photojournalistic" style to this area. From what we learned and believed in, we developed our own contemporary style of weddings that mix the best of the traditional with lots of true photo-journalistic candids, and our own in-between style that is relaxed, fun and romantic! We are there to capture the emotions, activities, and details of your special day in a fun, natural, creative and artistic manner. We want you to remember how you felt, not just how fantastic you and everyone else there looked . Over the years we have also added a more edgy fashion, stylized touch! We pride ourselves in being professional, fun and easy to get along with. We were privileged to be published in many of the local and nation bridal magazines, especially in the earlier years when the magazines would use images from their advertising photographers to go with articles that were published in many various states.. See the separate page dedicated to our published work over the years. This is your special day, ENJOY!! Let's talk about YOUR plans and what you are looking for..
We would love to talk to you about your specific wedding plans and what you are planning for your great day – then we can talk about how we can work with you – we'll go over your timeline and can give our input to as to how much time to allot to all the various aspects of the wedding. This is where our experience of 21 years works to your advantage. We are very flexible in our pricing and work on an a-la-cart basis so we can customize to your needs and budget.. Please give us a call so we can set up an appointment at the studio if possible, to go over all the specifics of your special day and the pricing options involved. Most of our weddings are with 2 main photographers! - . This way we can capture 2 vantage points at the same time without having to move around as much and be less obtrusive. - we will usually carry 2 cameras each and concentrate on either the wider or more zoomed in angles, We will also have an assistant there to help us - often Aaron or Steven who have now photographed many weddings with us and can photograph from another angle also. With a 2 photographer package includes 8 or 9 hours of coverage, unlimited locations and images - you usually end up with around a 1000 images of your special day to cherish forever. You will get a high res DVD of all edited images with a personal copyright release. Pricing is $2500 for the 2 photographer, an assistant and 8-9 hour coverage. You receive a DVD of all the edited files with a personal copyright release. Give us a call for other options...we try to work within your budget. Our albums are a-la-cart and we have many stunning beautiful albums to choose from in a range of prices..
We often include a $1000 credit into the contract if you prefer to include it in the contract price. This has included 24 sides of the great FINAO One album, with standard cover options. (www.finaoonline.com) We LOVE their many great albums to choose from, in all prince ranges. We will be working with more specific options here soon. The "Play Book" is another new option and we do have a new sample of that also. You can choose your favorites images to include in your album and Wally will custom design the album spreads for you to approve. They will be on our album proofing site , where you can make comments and changes. Nothing is printed until you approve and know what the cost of any additional sides might be!